The Center for Research and Education on Aging and Technology Enhancement (CREATE) represents a consortium of five universities, each with its own research team: Cornell University, University of Miami, Florida State University, Georgia Institute of Technology, and University of Illinois at Urbana-Champaign. Weill Cornell Medicine is the coordinating site with Dr. Sara J. Czaja as Director of the overall Center. This collaborative program includes three projects and a student research program. Each of the research sites are conducting separate projects that focus on complementary aspects of human interaction with technology. The intent is to integrate the expertise of the groups into a cohesive program for enhancing the ability of older adults to use technologies. 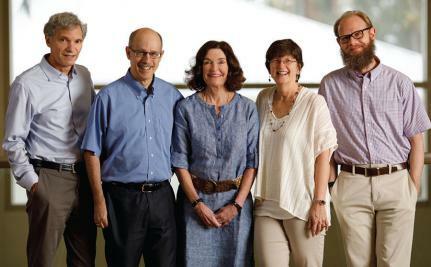 From left to right: Joseph Sharit, Neil Charness, Sara Czaja, Wendy Rogers, Wally Boot. Photo by Brian Tietz.